Two recent reads that I'd recommend. Douglas Coupland's JPod (see website http://www.jpod.info/ or the book on amazon) is a very funny, astute sort of book. 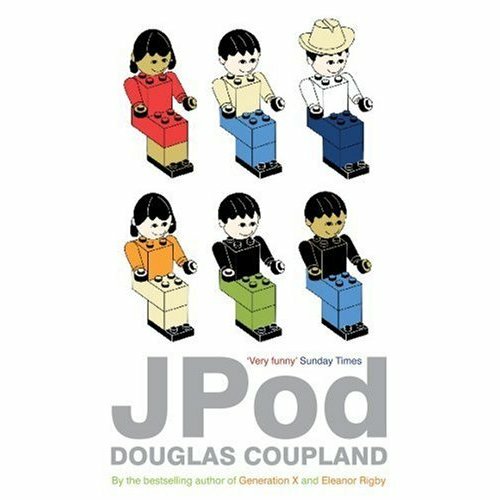 It's a creative, humorous satirical and deeply ironic look at the current hi-tech generation, and it is almost perfectly judged. I read it in the space of a couple of plane journeys and the assorted delays associated with them. Coupland is accessible and light without being too ephemeral. It's the first time I've read him – I think I'll have to take a look at his back catalogue, despite seeing him referred to, perhaps not unfairly, as specializing in ‘hyper-ironised glibness’. Of special merit are a number of stream of consciousness-like blocks of text interspersed in the narrative. They’re brilliantly done. The second book is a bit of a door wedge, but I'm really enjoying it. Andrew Marr's History of Modern Britain is something of a rarity: an interesting, absorbing history book. I guess Marr's skill lies in what he leaves out as much as what he includes. The tone is quite lively, seasoned gently with dry wit, and the text paints a vivid picture of the way Britain was in the 40s, 50s, 60s and 70s (I'm only now onto the 80s, and I’m looking forward to see how he deals with the nineties and noughties). The book also comes across as tremendously balanced. We all have biases when we re-tell stories. There's what 'actually happened', but the very act of observing what happened, even first hand, is a personal thing. The 'truth' passes through a set of filters. With a history like this, focusing heavily on the political landscape, the potential for skewing and bias is huge. Some people say that for this reason, all history is biased and any attempt to get to the 'truth' is doomed to failure. But I feel that we have a duty to try to get as close to we can, and be as free from bias as possible. And Marr's account does seem to do this pretty well. His interpretation of events seems a really intelligent, insightful and balanced one, and it's filling in lots of the gaps in my knowledge of postwar Britain. It's also forcing me to rethink some of my own views on this history, which in truth were probably not based on all that much information at all. I'm glad that you enjoyed Andrew Marr's book. I found it to be not as softly-centred as the TV programme and it was a good read. I quite like Coupland, but have to admit that I find him a little self-obsessed and smug. The one about the mad family with wacky Mum, Astronaut daughter and drop-out son is quite amusing. Black Swan Green by David Mitchell - a year in the life of a 13 year old boy set in 1982 (so he's a late 60's baby like yourself). Covering issues such as bullying, family politics and the Falklands, I'd say it's about the best thing I've read this year. Dunno if you've read "Cloud Atlas" but there's an amusing link to that, too. The 2nd book was "The Road" by Cormac McCartney - a very bleak post-apocolyptic story of a man and his son travelling through America, struggling to survive. Brilliantly written and utterly gripping. It really does have "classic" written all over it - like "Catcher in the Rye" or, indeed, "On the Road"